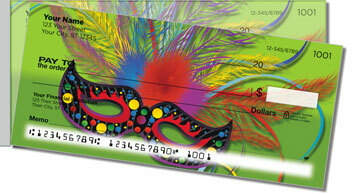 Put a party in your purse or pocketbook with these fun-filled Mardi Gras Checks from CheckAdvantage! This "party of four" includes a whimsical court jester's hat overprinting a field of yellow and purple Harlequin diamonds, a confetti-littered Bourbon Street sign and, of course, a feathered Mardi Gras eye mask and iconic theatrical face masks, too! 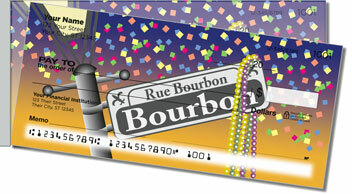 Now it's easier than ever to take the spirit of New Orleans with you wherever you go, thanks to our colorful Mardi Gras Side Tear Checks. 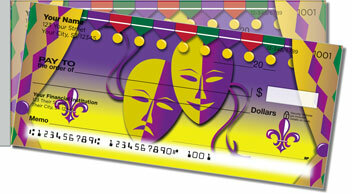 But brilliantly colored, cheerful designs aren't the only reasons why you'll love your new side-tear checks. 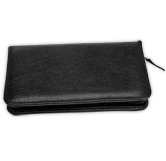 The short line of perforation gives you improved leverage for a quick, clean tear. 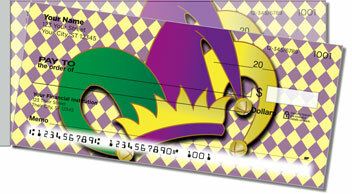 No more voided checks due to accidental rips! You can also get this series as a set of matching address labels to complete your order. Make both great products yours today!